Every aircraft has a unique registration number, usually printed on or near the tail – think of it like a license plate for an airplane. I track tail numbers on my flight log in order to let me keep track of whether I’ve been on a particular airplane before, and to let me know which particular airplanes I’ve flown on most often. If you can see the tail number of your plane, great! But if you can’t see it, you can usually find the tail number with a bit of detective work. 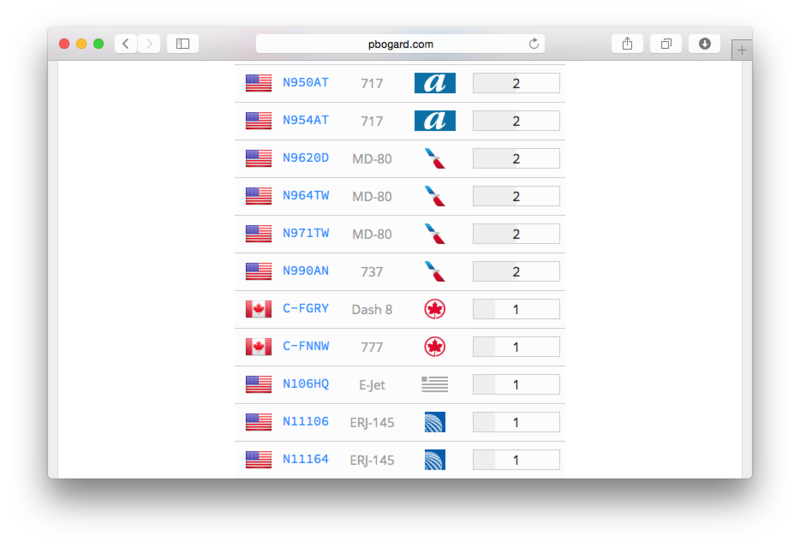 One of the minor features I’ve added to the flight log is country flags for tail numbers. Every aircraft is registered to one country, and each country has its own assigned format for tail numbers, so it’s possible to look at each tail number and determine what country it’s from. Since this operation is matching a string to a pattern, it made sense to create regular expressions for each country. For most countries, whose tail number is a unique prefix followed by a dash and three or four letters, this was easy to do. But the United States rules for valid tail numbers are substantially more complicated. 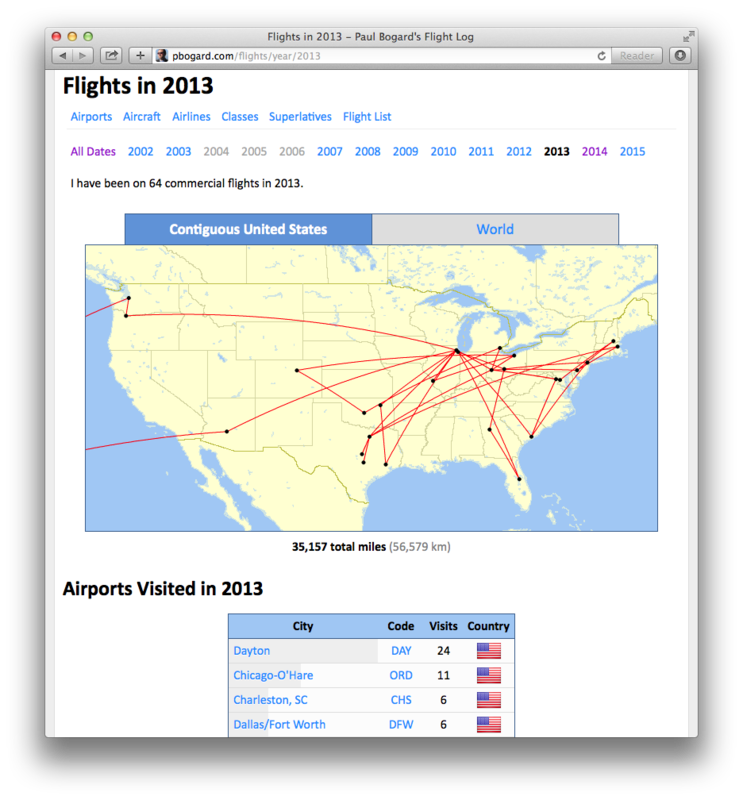 I’ve updated the Flight Log to version 1.3 by adding distances to flights, and by adding more statistics to the annual summary pages. At the bottom of the page, I’ve added the longest route, shortest route (for routes that actually have a distance), and shortest net distance (for routes where the origin is the same as the departure, and thus the net distance traveled is zero). 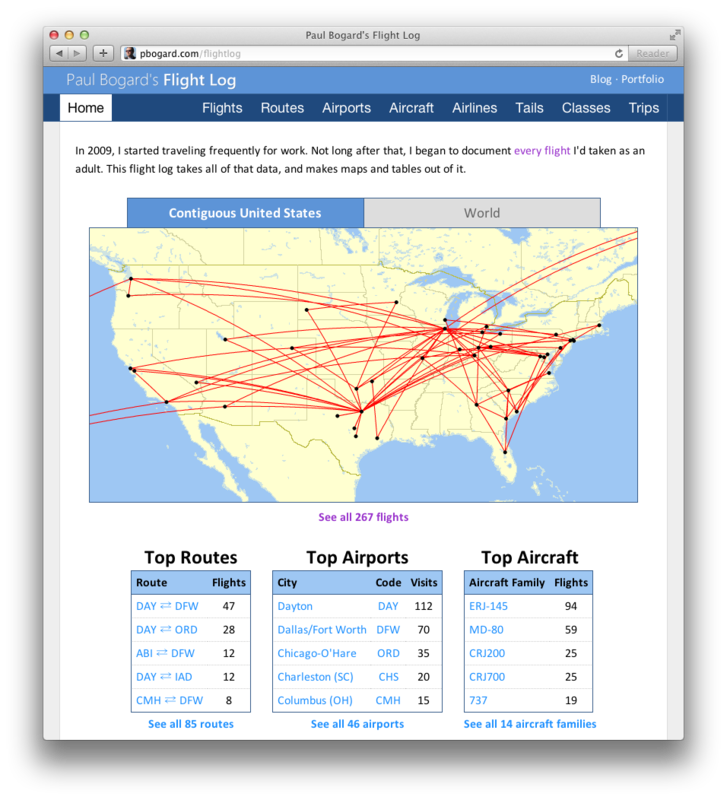 The total distance flown has been added for every flight, route, aircraft family, airline, operator, tail, fleet number, travel class, trip, and trip section. The index routes page now shows the great circle distance for each route. 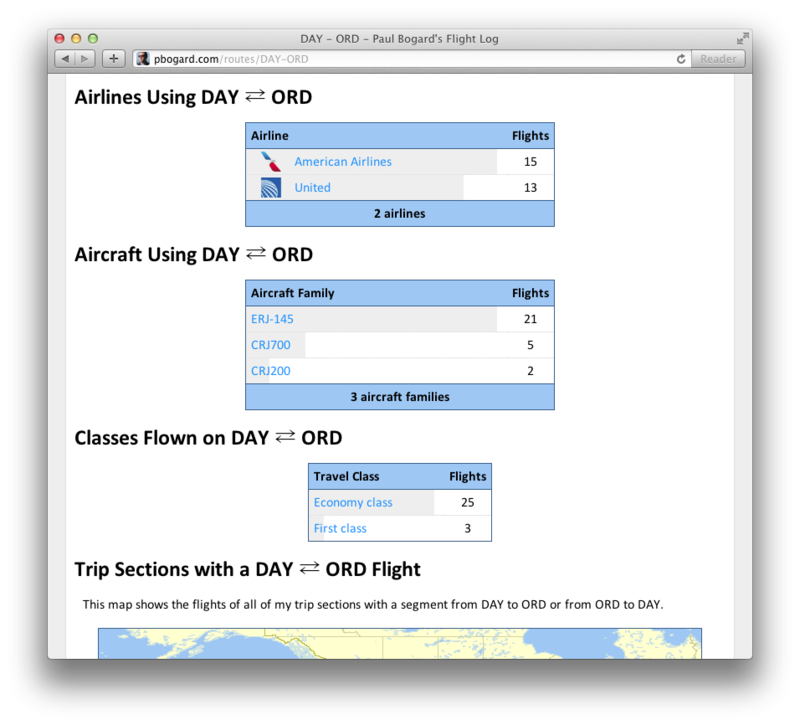 In addition, the page can now be sorted by either distance or number of flights. 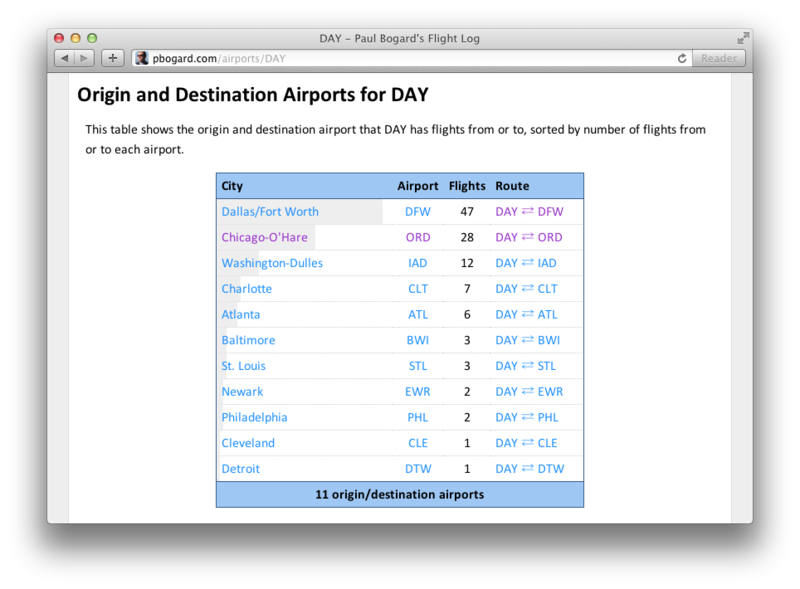 I’ve done the same thing on the show airport page, showing the distance to each of the direct flight airports. This table, too, is sortable. At the top of the index flights page, there have been links to years. Clicking on one of them would bring you to an annual summary page, showing a map and table of all of the flights in that year. Airports that were first visited in the year, aircraft families that were first flown in the year, and airlines that were first used in the year are noted in their respective tables. 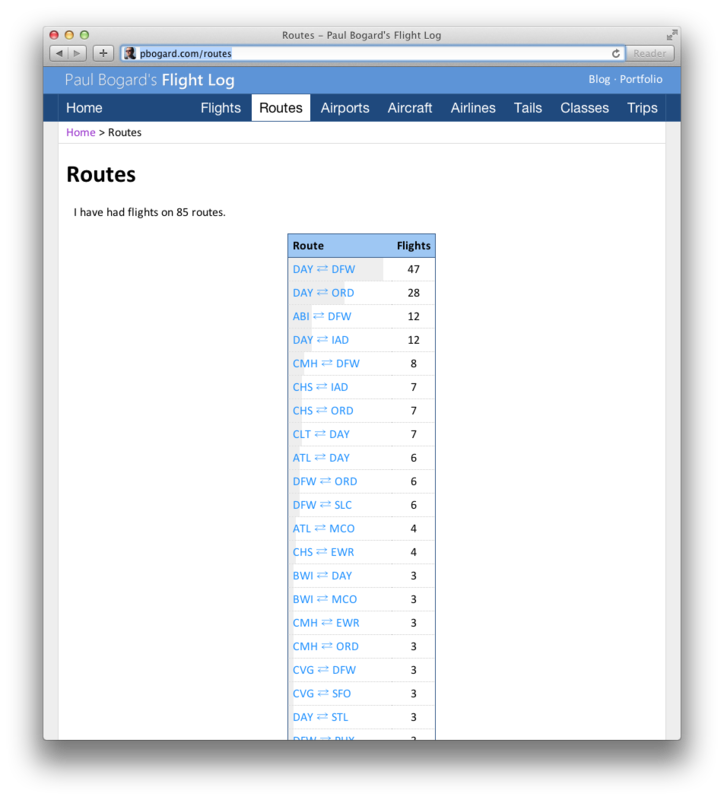 I’ve updated the Flight Log to version 1.2 by adding codeshares, operators, and fleet numbers to flights. Not all flights are operated by the airline that advertises it; often, airlines subcontract out flights to other airlines, particularly regional flights. In either case, whether the flight is operated by the advertising airline (i.e., United) or a different operator (i.e., ExpressJet), the Show Flight view now displays this. 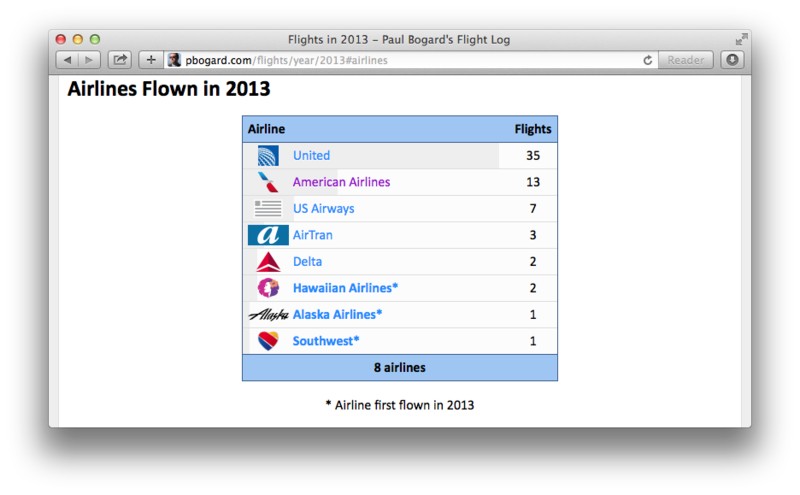 In addition, if the flight was a codeshare (where an airline sold a ticket on a partner’s flight), this is shown too. 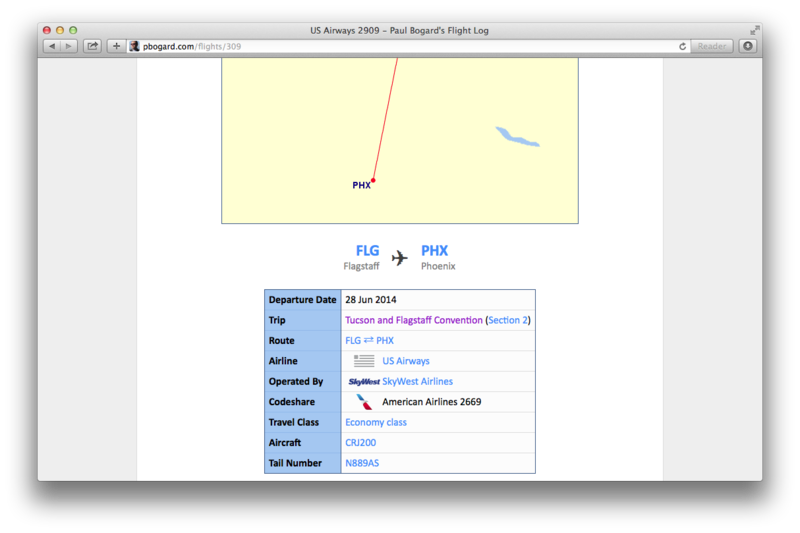 In this example, I bought a flight through American Airlines, but American Airlines didn’t offer a flight from Flagstaff to Phoenix, so they booked me a ticket on US Airways flight 2909, and American sold it to me (as a codeshare) as American Airlines flight 2669. 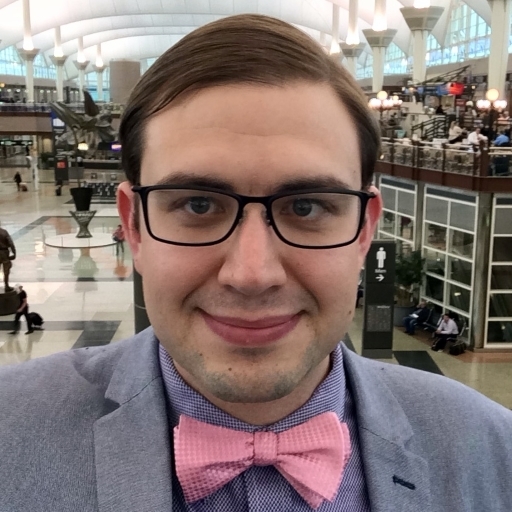 Then, since this was a short regional flight, US Airways didn’t operate it themselves; they subcontracted out to SkyWest Airlines to actually operate the flight under the US Airways name. In some cases, I know the fleet number the operator uses for the aircraft, so the bottom of this page contains a list of the known fleet numbers. 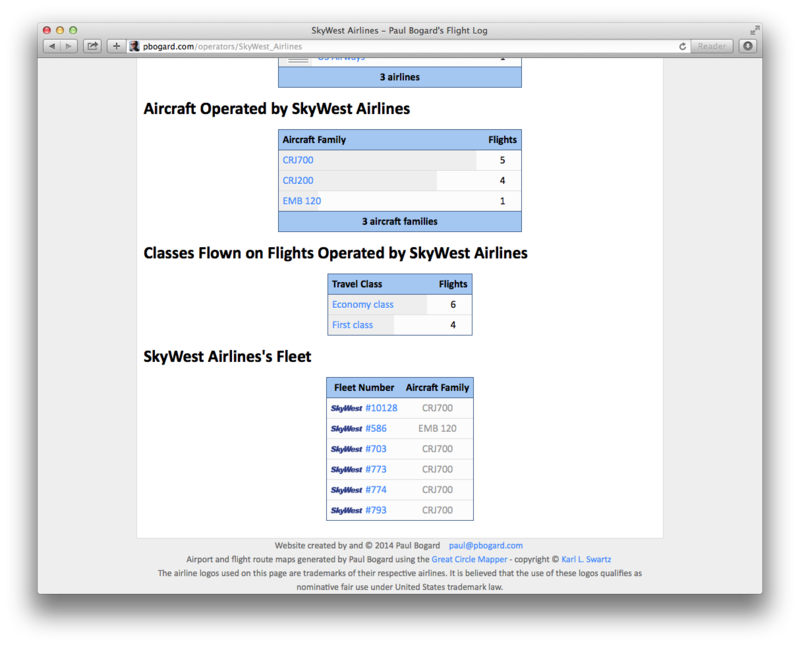 Clicking on any fleet number will show details for all flights flown on that operator-fleet number combination. 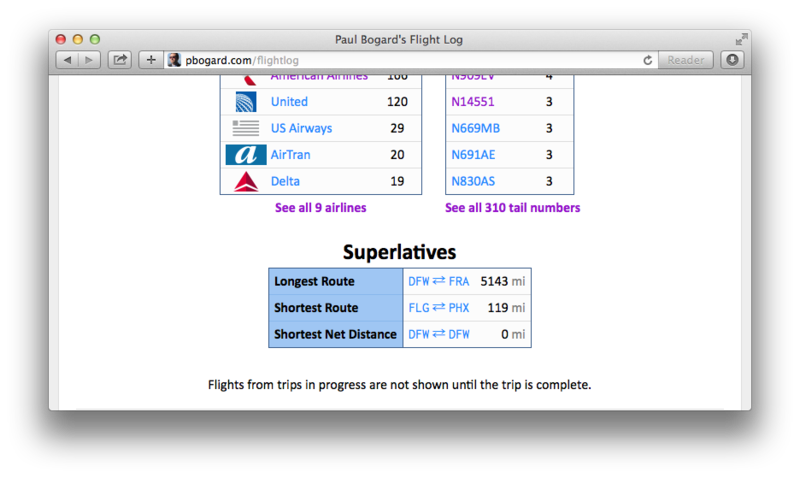 …I fly on a lot of regional jets. 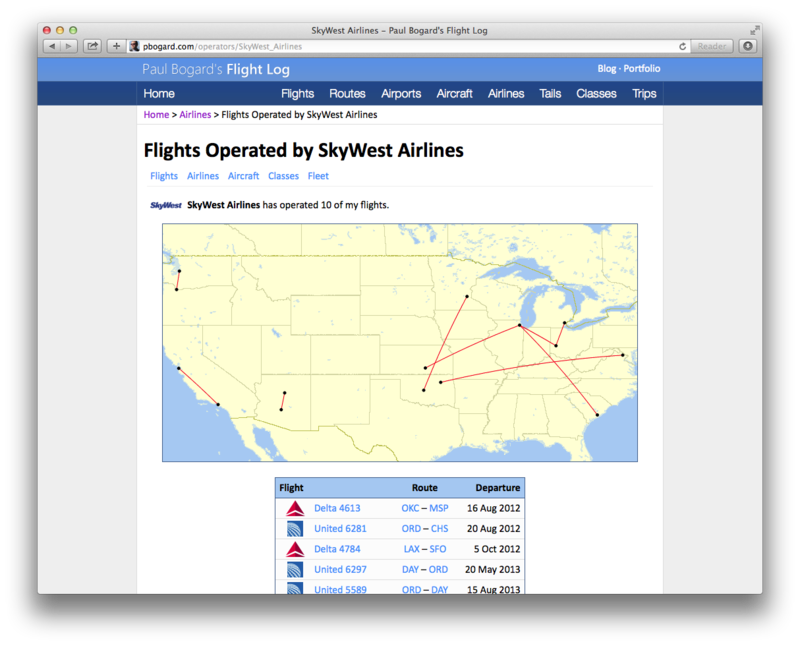 Version 1.1 of the Flight Log is now live. 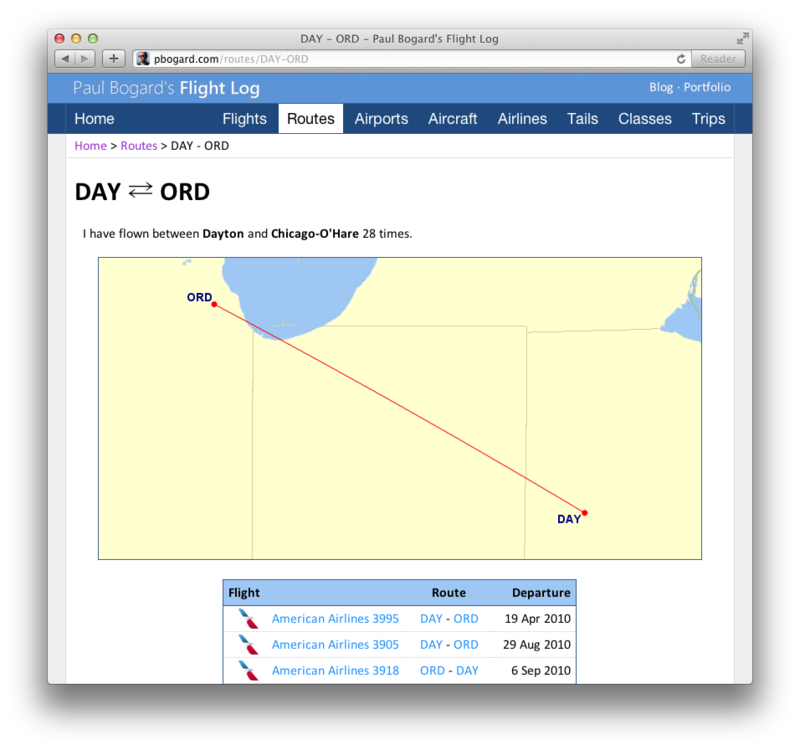 On the old version of the flight log, I had a rudimentary display of routes – the Show Flight page would list all sections and trips that shared the same route. 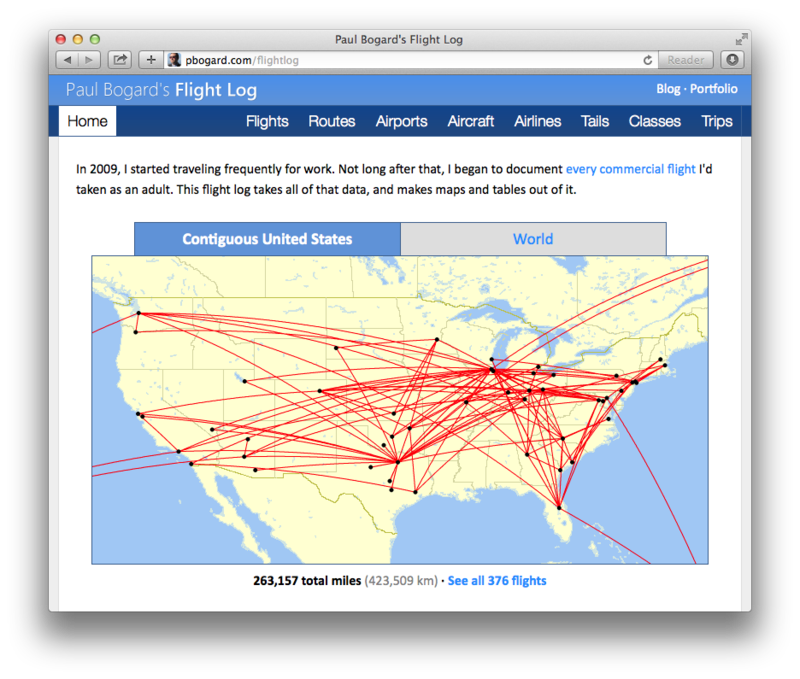 There was, however, no easy way to see which routes were the most flown. Consider that solved, with my new Routes page! 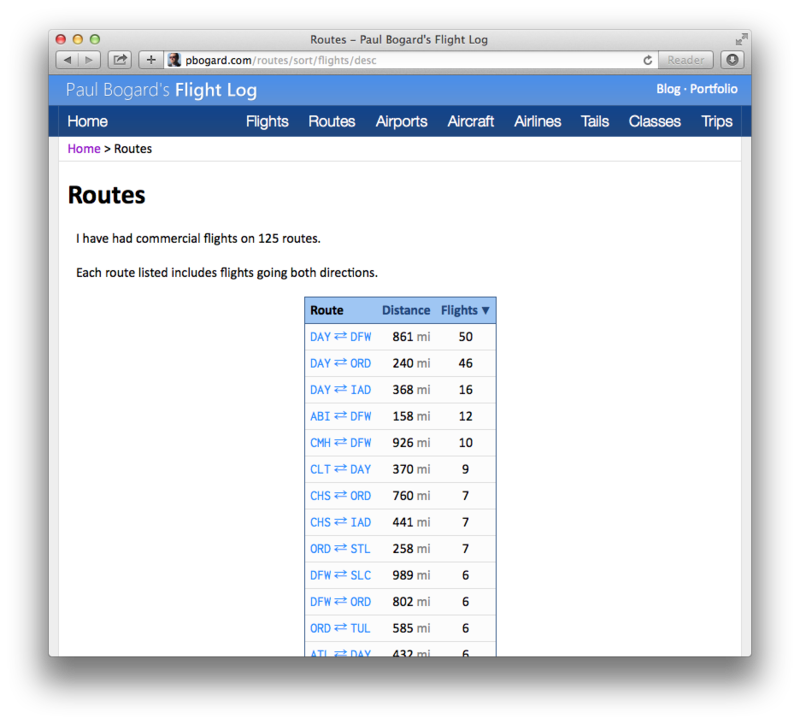 The same airlines, aircraft, and class lists were added to the Show Tail, Show Airport, Show Airline, Show Aircraft, and Show Class pages as appropriate. In addition, under each of the top 5 lists, the home page shows the totals for the various statistics I track. 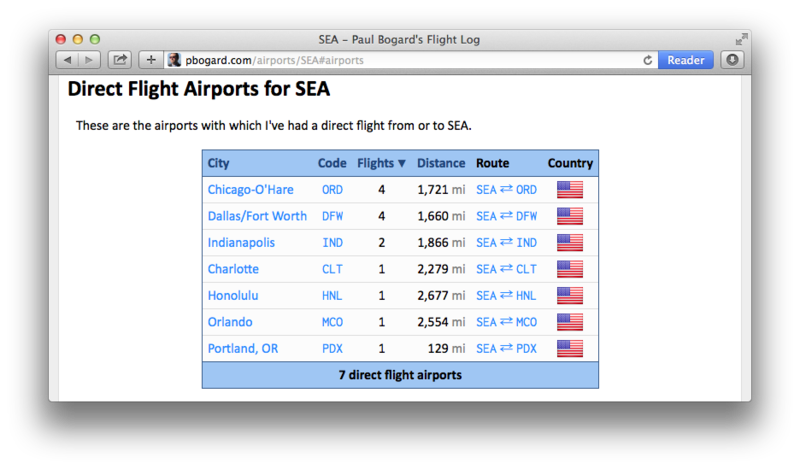 No more extra clicks are required to see how many airports I’ve visited! This table also links to the new Show Route pages. 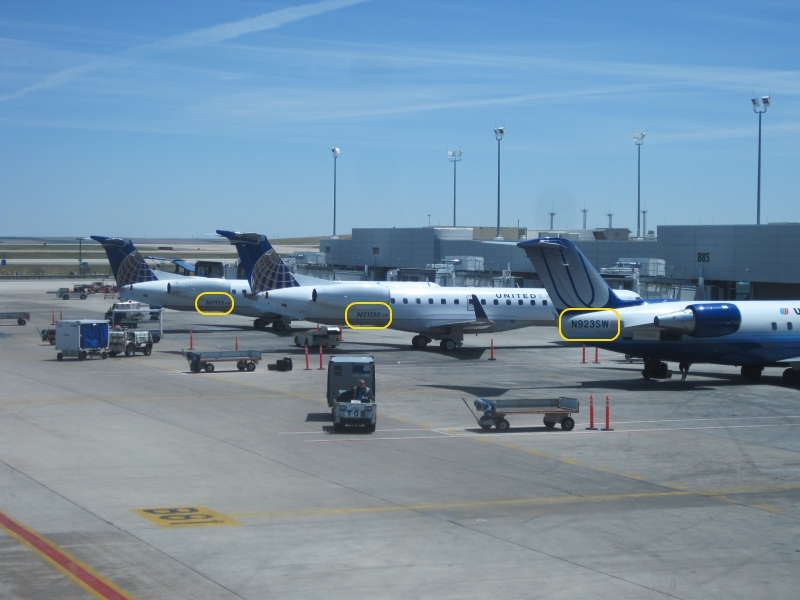 Back in July, I wrote about how I’d only been tracking tail numbers since 2012. Last week, I found a source to help me fill in a good portion of my missing tail numbers. 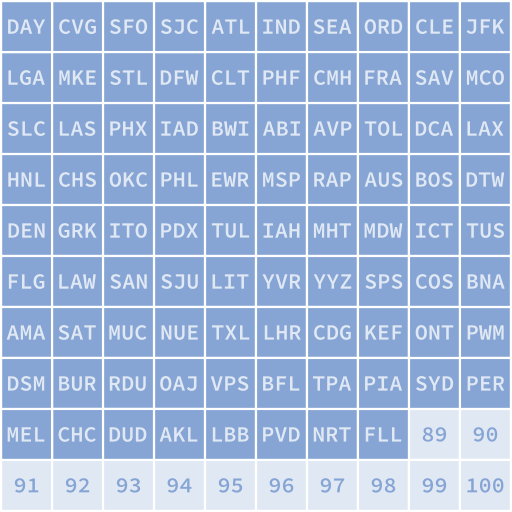 The Bureau of Transportation Statistics keeps records of airline on-time statistics for United States domestic flights. In particular, their detailed statistics for departures, arrivals, and airborne time have flight number and tail number data. Incidentally, with a date, origin or destination airport, and flight number, I could find the tail number of many of my past flights. Many flights (particularly to smaller markets) are operated by feeder airlines operating under the name of a major airline. For example, my United flight 4255 on 7 December 2012 from CHS to EWR was actually operated by ExpressJet, so searching for United flights departing CHS on 7 December 2012 would turn up no results for flight 4255. Instead, I’d have to search for ExpressJet flights. Only airlines with at least 1% of domestic passenger revenue are required to report on-time data. 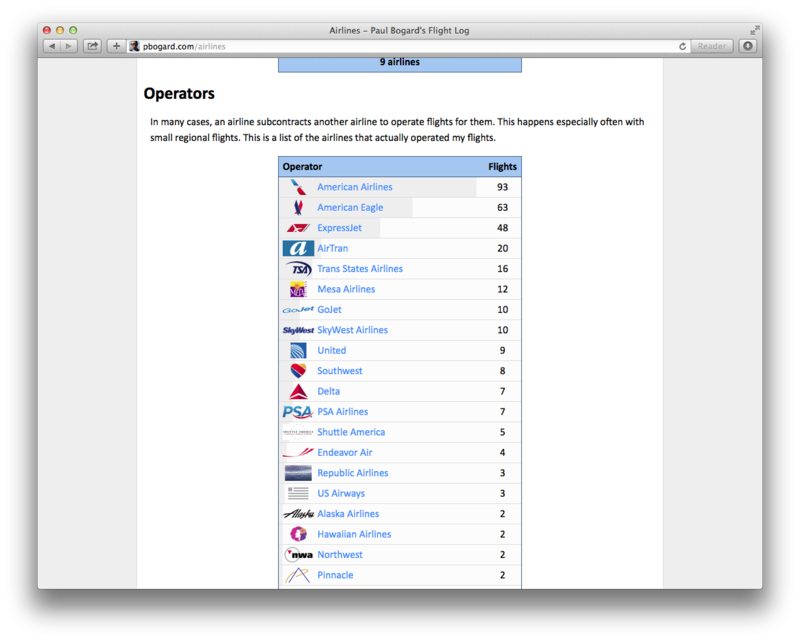 Therefore, not every feeder airline reports data, and I was unable to get tail numbers for those flights. International flights are not in this database. 2013 data are not yet available. The reported tail number was not always the actual tail number; in some cases, it appeared to use the airline’s fleet number instead. In particular, this seemed to happen more often than not on American Airlines and American Eagle flights. American Airlines flights seemed to be reported in the form N[fleet number]AA, such as N493AA or N3FHAA. For American Airlines flights, then, I had to look up the aircraft in the fleet data for American Airlines on Planespotters.net, finding the fleet number in the Fleet Number column and retrieving the tail number from the Reg column. In the case of fleet number 493, the registration was N493AA, so the BTS on-time data tail number was correct. However, with 3FH, the tail number was actually N831NN. American Eagle flights were similarly reported as N[fleet number]MQ, forcing me to do the same thing with the American Eagle fleet data. In this case, though, the fleet number often isn’t listed. When this happens, if there was a single registration number that contained the fleet number (N939AE for #939, N933JN for #933, etc. ), and the aircraft family was the same as the one I already had on record, I used that. Even with the above, the BTS website was still a great source of data, and I now have tail number data for 91% of my flights. This data helped me find out that there were quite a few more tails I’d flown on more than once, including three additional tails I’d flown on three times (beyond N909EV, which I already knew about). One of the three-flight tails was N691AE, of which I already had a photo. The flight log airport frequency map now represents the number of times I’ve visited an airport with the area of the rings around the airports instead of the radius, conforming to bubble chart best practices.